Heat oven to 375°F. Spray 9-inch square pan with baking spray with flour. In large bowl, mix oats, flour, brown sugar and salt. Cut in butter, using pastry blender (or pulling 2 table knives through mixture in opposite directions), until mixture looks like coarse crumbs. Reserve 1 cup mixture for topping. To remaining mixture, stir in egg until just moistened. Press dough firmly and evenly into bottom of pan, using fingers or bottom of measuring cup. Spread with jam. Arrange raspberries over jam. Stir almonds into reserved crumb mixture; sprinkle evenly over raspberries. Bake 30 to 35 minutes or until top is golden. Cool completely on cooling rack. Cut into 4 rows by 4 rows. 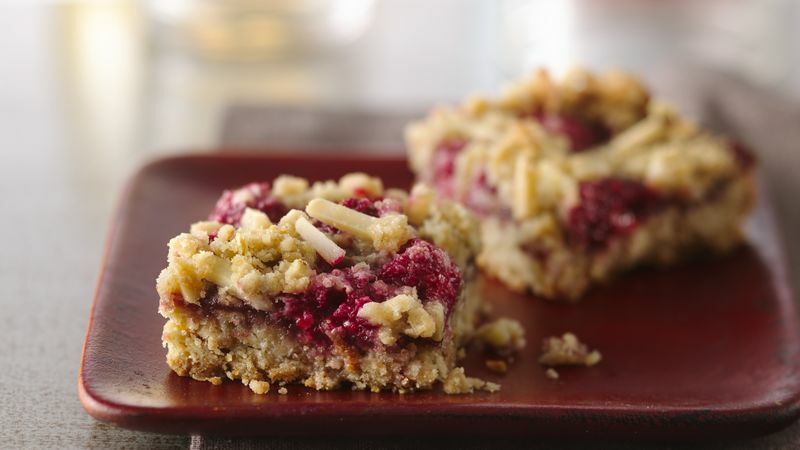 For Chewy Blueberry Almond Bars, substitute fresh blueberries for the raspberries. If you don't have baking spray with flour, grease the pan with cooking spray and dust lightly with flour.